Hape’s All Season Doll House (furnished) is a beautifully designed dollhouse sure to provide your child with endless inspiration to role play and imagination various domestic situations for their doll family. 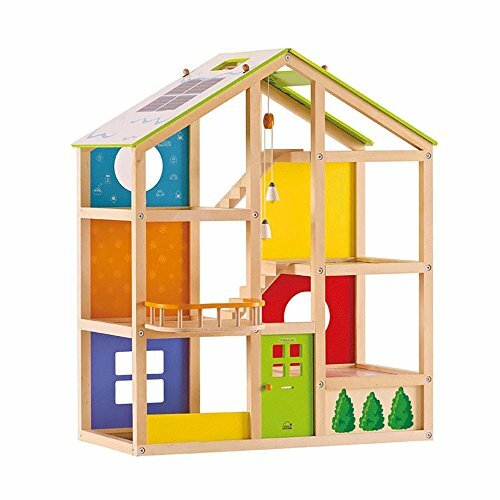 With the reversible solar paneled roof, your child can play all year round from sunrise to sunset. The dolls house features six complete room doll furniture sets. The doll family can read books in the cozy garret, rest well in a master bedroom, clean up in the family bathroom, be entertained in the media room, cook up a storm in the kitchen and spend quality time in the living room. 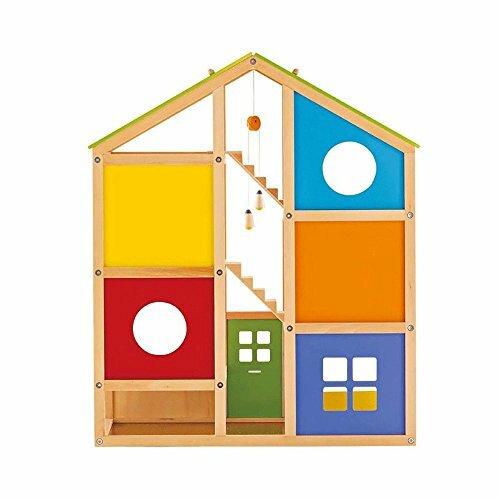 The dollhouse can inspire your child’s creativity as it has moving parts allowing your child to arrange and decorate the house anyway they like. The house will last in your family for a number of years, it is durable with a solid wood construction sourced from environmentally sustainable forests. Importantly It is finished with brightly colored child safe paint. The doll family house sparks imagination and creativity, encouraging imitative and imaginary play, and promoting fantasy storytelling. The house also teaches valuable social skills such as communication, cooperation, encourages trust, friendship and language development.